VW cars have stood for being good value, featuring well thought of German engineering. The latest generation of the Jetta offers all of this and more by packaging a nice array of standard features, safety and comfort that many competitors don’t offer or only offer as options. The Jetta R-Line is a mid-level trim within the Jetta line that gives the buyer a bit more sportiness as well as excellent value. Its priced in the middle of the pack with a starting base of $23,245.00. 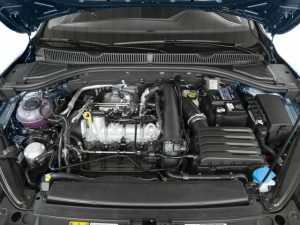 While the entry level S version is at $18,745.00 and the SEL Premium at $27,695.00 respectively. 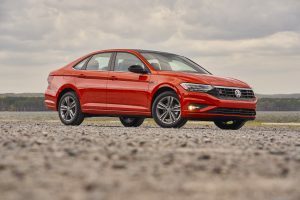 The newest Jetta offers an updated, evolutionary styling, offering more room, better aerodynamics and a surprisingly quiet cabin, even at fast, highway speeds. There is clear emphasis on maximizing fuel economy and value together with a nice splash of style to boot and a surprisingly affordable monthly payment! Thank you, VW! The standard features and technology on the R line include: Blind spot monitors, forward collision warning, auto-start-stop feature that thankfully can be turned off and a new, 8-speed auto transmission with electronic differential. Additionally, there is a moonroof, leather steering wheel, 17” wheels vs 16” on the S trim level, Apple Car Play, a climate control system offering dual zones and keyless access. 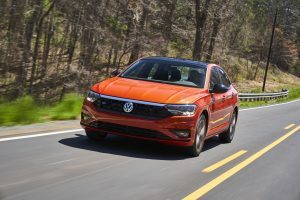 Our one week with the optional colored orange paint Jetta that VW calls Habanero Orange, which I loved, had using the Jetta in all kinds of rolls. We piled in the family for dinner and did a full-cart grocery store run. The Jetta handled each of these real-world tasks like a champ. The nicely balanced progressively assisted power steering feels great, regardless of the speed. Brakes are direct and strong offering a communicative pedal feel. Dash and interior are simple, clean and tidy. I would even say, modern minimalist, but not spartan. There are no paddle shifters for when feeling a bit sporty, so we had to make do with shifting to “Sport Mode” and using the shift selector in a fore and aft motion to manually shift the gears up or down. I found myself driving on this setting often and that made for a bit more liveliness from the peppy 1.4-liter engine and the automatic transmission. Proven name, great design, comfortable and full of value. 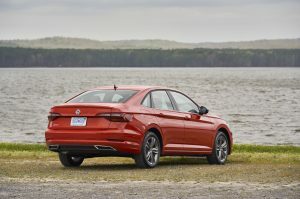 The 2019 VW Jetta R-Line is an excellent car for a 1st time new car buyer or for a new driver in your household. Try one, you will be surprised. Trunk lid that would come back down when there is a bit of wind blowing.